Shares of Dr. Reddy's Laboratories slumped nearly 3% as investors were unimpressed by the company's earnings for the December quarter. The drug maker reported a consolidated net profit of Rs290cr, sharply below analysts' estimate of Rs350cr. Continued rise in pricing pressure and lack of new product launches in the US during the quarter weighed on the company's operating margin, which contracted 250bps on year to 21.2%. Shares of Biocon slumped over 4% after the company reported a 46.4% on-year fall in consolidated net profit for the December quarter at Rs91.9cr, below analysts' estimate. Revenue from operations for the quarter was at Rs1058cr, against Rs1044cr a year ago. Sales in Oct-Dec were in line with estimates. NCC stock is up 3.3% on the back of news that the Board of Directors of NCC will meet on January 30, 2018, to consider and approve the issue price, including a discount for the equity shares to be allotted to the qualified institutional buyers in the issue. NCC Ltd is one of the largest Indian construction companies in terms of revenue. The company’s order book was worth Rs28,109cr as of October 2017. The revenues of the company were impacted by GST implementation. We expect the company to report revenue CAGR of 3% over FY17-19E. We estimate the company’s margin to rise by 70bps on the back of cost optimization and timely execution of projects. We expect the company to report PAT CAGR of 3% over FY17-19E. Glenmark Pharma has reported positive clinical trial data on its phase 1 molecule GBR 1302. GBR 1302 is a potential drug candidate for Breast Cancer and Gastric Cancer. The company has indicated that the preliminary data for GBR 1302 tells about the spikes in peripheral blood cytokines and a drop in T cell levels suggesting the potential for T cell activation. The company has said that it is encouraged by these initial findings and look forward to continuing the studies. GBR 1302 is Glenmark’s lead immuno-oncology agent based on the proprietary BEAT® bispecific antibody engineering platform. Dr. Reddy’s has announced that the German drug regulator has carried out re-inspection of its Bachupally formulations plant (unit 2). The company has successfully completed this re-inspection as its subsidiary Betapharm has received a communication from the regulator that it can now start dispatching products to Europe from this plant. The status of the EU GMP non-compliance is also to be removed from its plant by the Government of Upper Bavaria. RBL Bank stock fell over 4% after the company reported an increase in bad loans in Oct-Dec, and net profit missed estimates. For Q3FY18, RBL Bank’s NII improved by 45% yoy to Rs467cr against Rs322cr in Q3FY17. The NIMs for Q3FY18 stood at 3.89%, which improved by 15bps qoq. The bank’s net profit was below estimates, improvement of 27.9% yoy to Rs165cr against Rs129cr. Its GNPA for Q3FY18 stood at 1.56% against 1.44% qoq, which has increased by 12bps. NNPA for the quarter came at 0.97% against 0.78% qoq. The advances for the quarter came at Rs36, 890cr, up 38% yoy and 10% qoq. Ashok Leyland Limited (ALL), one of the largest commercial vehicle (CV) manufacturers in India, bagged an order for 1,200 trucks from VRL Logistics Limited (VRL). The order for 1,200 trucks is for two models – “AL 3123” and “AL 3723”, for 600 units each. ALL released this to the stock exchanges on January 24, 2018. The order amounts to Rs350cr. VRL is a key client for ALL since the former sources 80% of its CV requirement from the latter. ALL is the third largest manufacturer of commercial vehicles (trucks, buses, tippers, trailers and defence vehicles) in India with ~18% market share. The company is also engaged in the manufacturing and selling of engines for industrial and marine applications, spare parts and special alloy castings. Bharti Airtel Ltd (Airtel) a leading global telecommunications services provider with operations in 16 countries across Asia and Africa, announced that it has received an approval for the acquisition of Tigo Rwanda Ltd (Tigo Rwanda), a subsidiary of Millicom International Cellular S.A. (Millicom) from the Rwanda Utilities Regulatory Authority (RURA). The merged entity will have the largest customer base in Rwanda with 5.9 million subscribers. The combined networks of the two companies will serve customers with voice/ data services, global roaming and mobile banking services. It will also have Rwanda’s largest sales and distribution network. The merger will result in the only negative ebitda OpCo joining other 13 positive ebitda OpCos in Africa. India’s leading dry cell battery maker, Eveready Industries India Limited (EIIL) will form a Joint Venture (JV) with Indonesia based Universal Wellbeing Pte. Ltd. (UW) for manufacturing, importing and marketing of Fast Moving Consumer Goods (FMCG) in India. EIIL will hold 30% stake in the soon-to-be-formed JV while UW will hold the remaining 70% stake. EIIL announced this to the stock exchanges on January 24, 2018. EIIL plans to make use of its pan-India battery distribution network to sell a bouquet of FMCG products in urban and rural areas. As per its FY17 Annual Report, EIIL has a 4,000+ distribution network and 42 distribution centers. EIIL’s products are available across more than 3.2mn outlets. Media reports suggest that Bank of Baroda is expected to float its $1bn qualified institutional placement of shares in two to three weeks. In November, The Finance Committee of the Board approved the proposal of raising additional equity capital aggregating up to Rs6, 000cr by way of a rights issue or qualified institutions placements (QIP). This move is positive for the bank, as it would provide much-needed headroom to provide for bad loans and would also help for next leg of loan growth. The stock would react positively to this news. Banks have been raising funds in the past few months to boost their capital adequacy ratio ahead of the government's recapitalization plan. Oil and Natural Gas Corporation (ONGC) signed a deal to acquire 51.11% government stake in Hindustan Petroleum Corporation Limited (HPCL). As per media reports, ONGC has got approval from the government for selling its stake in IOC and GAIL to help fund its acquisition with HPCL for which it requires ~Rs36, 915cr. ONGC currently holds 13.77% stake in IOC which at current Mcap values to ~Rs 26,000cr. In GAIL, it holds ~4.86% stake valuing to ~Rs3900cr bringing the combined stake sale value to ~Rs29, 900 cr. The company is currently evaluating various options for funding its HPCL acquisition. ONGC management is considering its cash first, followed by its liquid assets, although it won’t sell its liquid assets in distress. Company also has offers over Rs50, 000cr debt at very competitive rates. Shares of Indian Oil Corp (IOCL) gained nearly 3% ahead of its board meeting on Jan 30, where the company will consider a bonus share issue. The stock was the best performer among Nifty 50 constituents. While a bonus share issue does not change fundamentals of a company, it increases liquidity in the stock, often pushing up share prices. Design, supply, erection, testing and commissioning of railway electrification work for Rs123cr Pipeline augmentation work in Rajasthan for Rs366cr from a private client. Torrent Pharma has indicated that its board will consider raising funds in a meeting scheduled on January 25. This fundraising could be either in form of issuance of equity shares (including convertible/non-convertible debentures/bonds) through QIP or depository receipts or by way of private placement or any other mode. Torrent Pharma has recently completed two acquisitions i.e. domestic formulations business of Unichem Laboratories acquired in December 2017 and US-based generic, OTC player Bio-Pharm Inc in January 2018. Both the acquisitions are to solidify its business in India and US respectively. Bio-Pharm, Inc has a USFDA registered manufacturing facility in the US and Torrent is planning to scale this facility up and start filling more products from there. Shares of Multi Commodity Exchange (MCX) rose nearly 2% today after SBI Mutual Fund bought 1.61% stake in the company through a bulk deal on the NSE on Monday. The fund house bought the shares at 840.50 rupees apiece. In a separate deal, Barron International Growth Fund sold 1.13 mn shares or 2.2% stake in the company. MCX is currently trading at Rs850.5, up by Rs9.35 or 1.11% from its previous closing of Rs841.15 on the BSE. The scrip opened at Rs857.05 and has touched a high and low of Rs858 and Rs847.75 respectively. So far 141378 (NSE+BSE) shares were traded on the counter. The current market cap of the company is Rs4289.87cr. Country's third largest private sector lender Axis Bank's third-quarter earnings beat analyst expectations, with improvement in asset quality performance. Profit during the quarter grew by 25.3 percent year-on-year to Rs 726.4 crore despite fall in other income & operating income, driven by lower provisions and higher net interest income. Net interest income, the difference between interest earned and interest expended, grew by 9.2 percent to Rs 4,731.52 crore compared to Rs 4,333.73 crore in year-ago, with strong loan growth at 21 percent YoY. Oil and Natural Gas Corporation (ONGC) signed a deal to acquire 51.11% stake in Hindustan Petroleum Corporation Limited (HPCL) for about Rs36,915cr in an all-cash deal, which would close by end of Jan 2018. The deal is proposed to buy 778845375 equity shares in HPCL at a cash purchase consideration of Rs473.97 per share which is ~13.8% premium to HPCL’s closing on Friday (BSE). The goal of this deal was to create an integrated oil major to compete with global rivals and will help the government meet annual disinvestment target. The deal is exempt from a public offer as both the entities are related parties but the acquisition involving two listed entities have been carried out on an arm’s length basis. A federal court in the US has imposed a $5mn civil penalty on a subsidiary of Dr. Reddy’s Laboratories for distributing prescription drugs in blister packs that were not child resistant. Child-resistant packaging is a critical safety measure. Dr. Reddy’s failed to ensure that children were protected from potentially harmful prescription drugs and that it failed to comply with Poison Prevention Packaging Act (PPPA) and the Consumer Product Safety Act (CPSA) according to the US Department of Justice. As per the complaint, Dr. Reddy’s distributed such prescription drugs until 2012 and also failed to notify the Consumer Product Safety Commission. Tata Motors Ltd (TML) has increased ex-showroom prices of all its cars by 1.0-3.7% in Mumbai. This comes after the company offered a limited-period insurance and exchange offer to its customers on five models. According to Cogencis, the company has raised prices of the Tiago hatchback by 1.3-2.4% for the petrol variant, and 1.7-2.6% for the diesel variant. Prices for Tiago's petrol variant now start at Rs3, 31,646 ex-showroom Mumbai, and Rs4, 11,181 for the diesel variant. TML, on the consolidated level, derives ~80% of its revenue from a wholly owned subsidiary, JLR, which had witnessed EBITDA margin decline in FY16 and FY17 on account of weakness in volumes growth, model mix, and forex losses. Standalone business (~80% CV and PV) has experienced market share losses and is expected to turnaround the trend on account of better acceptance of SCR technology (CV) and series of new launches in PV segment (Tigor/Hexa/Tiago). Tata Steel announced that it would be raising Rs12, 800cr via a rights issue in mid-February 2018. The rights issue would consist of two simultaneous but unlinked offers of – (1) 15.54cr fully paid up shares at Rs510 per share, and (2) 7.77cr partially paid-up shares at Rs615 per share. The company would raise up to Rs8, 000cr from the first offer and Rs4, 800cr from the second offer. The rights entitlement ratio for the fully paid up shares is 4 fully paid up shares for 25 ordinary shares held on the record date. The rights entitlement ratio for the partially paid-up shares is 2 fully paid up shares for 25 ordinary shares held on the record date. The record date for the issue is February 1, 2018. The issue would open on February 14, 2018, and close on February 28, 2018. 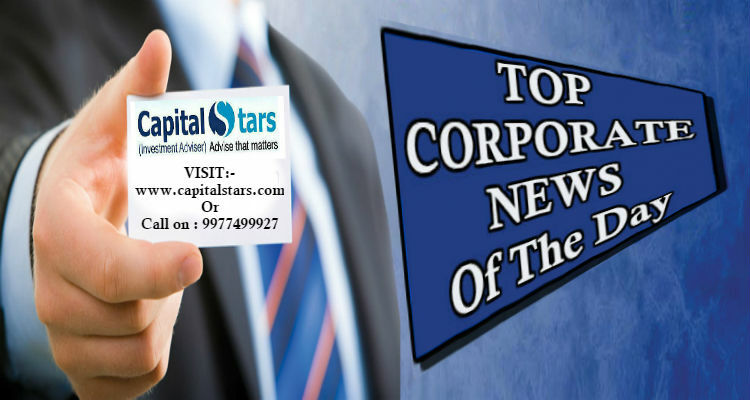 On December 19, 2018, the Board of Directors of Tata Steel had approved the raising of capital via rights issue as well as a 5 mtpa expansion to the Kalinganagar steel plant. Currently, the Kalinganagar steel plant has a capacity of 3mtpa and had a utilization level of 100% for Q3FY18. Please do not buy below 8025, below that every rise will be a selling opportunity. We may see 7600/7450 level in coming days. Sell as remain below 17500, we may see 16900/16800 level in coming days. Once break 16800 level it may show 16350/16100 level. Key benchmark indices dropped sharply on first trading day of the week on weak global cues. After gyrating in small range between positive and negative zone for most part of the day, key indices saw a sell-off in last hour of trade. The barometer index, the S&P BSE Sensex, was down 236.03 points or 0.91% at 25,627.47, as per provisional closing data. The 50-unit CNX Nifty was down 72.80 points or 0.93% at 7,795.70, as per provisional closing data. • Vedanta (down 4.25%), JSW Steel (down 2.27%), Tata Steel (down 2.83%), Steel Authority of India (Sail) (down 2.65%), Hindustan Zinc (down 4.62%), Jindal Steel & Power (down 2.34%), National Aluminium Company (down 1.37%), Hindalco Industries (down 1.12%), Hindustan Copper (down 2.29%) edged lower. • Auto stocks declined. Hero MotoCorp (down 1.41%), Eicher Motors (down 2.88%), Bajaj Auto (down 0.14%), Ashok Leyland (down 0.33%), Mahindra & Mahindra (down 0.36%), TVS Motor Company (down 2.21%) and Maruti Suzuki (India) (down 0.99%) edged lower. 1. The market breadth indicating the overall health of the market turned negative from positive in late trade. On BSE, shares 1,578 declined and 1,132 shares rose. A total of 131 shares were unchanged. The BSE Mid-Cap index was off 0.28%. The BSE Small-Cap index was off 0.21%. The fall in both these indices was lower than the Sensex's decline in percentage terms. 2. In overseas markets, European and Asian stock markets edged lower with trading sentiment hurt by another weak data release from China. Markets in Hong Kong, Taiwan and South Korea are closed for holiday. Economic data showed that China's industrial profits fell 8.8% in August from a year ago, extending July's 2.9% fall as the slowing economy hit enterprises' profitability. US markets ended on a mixed note on Friday, 25 September 2015 due to a sharp sell-off in biotech and healthcare stocks. Prospects for the US economy generally appear solid, Federal Reserve Chairwoman Janet Yellen said in her speech late Thursday, 24 September 2015 after US markets had closed. She argued in favor of hiking interest rates this year, giving more clarity to Fed watchers. 1. 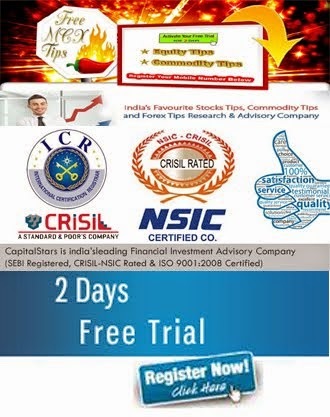 In today’s session we have seen call buying in 7800 and 7900 strike price, we may see 7900 as a strong resistance level in coming days. 2. HINDALCO 75 and 80 calls and puts were so active, we may see buying above 75 level. 3. HDIL 65/70 calls were so active today, we may see more buying as remain above 58. Sell TITAN as remain below 330 we may see 315/300 LEVELS, above 330 major resistance will be 342. Buy VOLTAS above 250 for the target of 270/280, below 250 major support will be 244. • GAIL ABOVE….? TGT…..?STOP LOSS……? • SELL ICICI BANK BELOW…..?...TARGET….?..STOPLOSS…? • SELL ONGC BELOW….? 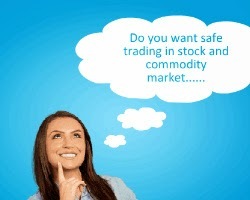 STOCK MAY SHOW 190/210 LEVEL IN COMING DAYS WITH STOP LOSS…? Today Nifty market move on down at -20.95 and currently closing nifty is 8152.95. Today Rupee is 60.29/1 Dollar. Mainly Company point move on 2 to 3 point in nifty market. before some month rupee was moving on 62 or 63/ 1 Dollar but this time nifty is going to record high movement this week so rupee down. Researcher said come to some month the rupee move down something 58 or 59/1 Dollar. Jindal Steel and Coal India gained 1-2 percent ahead of SC hearing that announced after market hours. Supreme Court reserved its order in coal block allocation case but has not given any date to pass the order. Steel and power producers sought for appointments of Judicial Committee for fact findings.